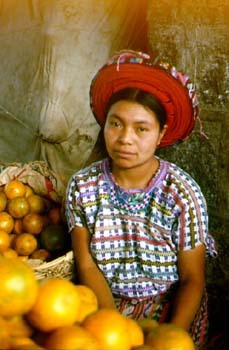 Undoubtedly the most colorfully costumed people in the Americas are the Highland Maya of Guatemala. 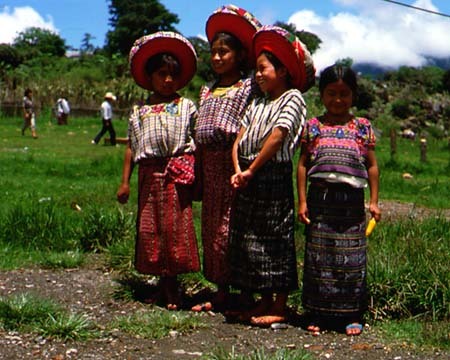 While traditional native dress has disappeared in many parts of the world, Guatemala remains a place where a high percentage of the indigenous people still proudly wear their traditional dress called traje. 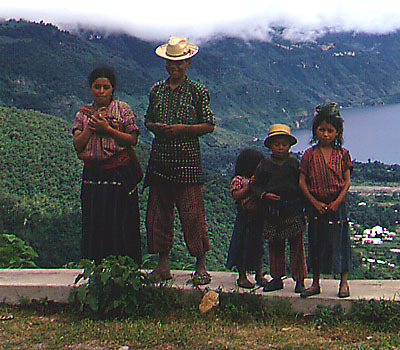 Moreover, in Guatemala, Maya traje is village-specific or language-group related. Thus, with dozens of Indian towns and villages, and 21 different Mayan ethnolinguistic groups represented, the variety of indigenous costume is truly dazzling. 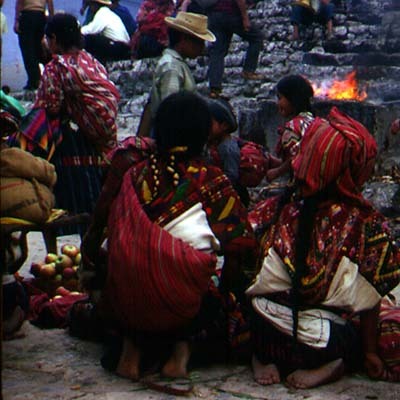 The photos on this website will give you an introduction to a few of these astonishing and beautiful modes of native dress in Guatemala, and the fascinating and dignified Highland Mayan people who wear them. Nebaj is a town high in the Altos Cuchumatanes mountains. 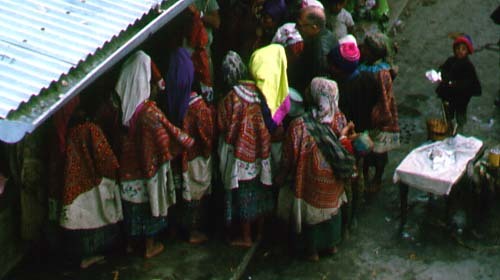 The people of Nebaj, and neighboring Cotzal and Chajul speak Ixil, one of Guatemala's smaller ethnolinguistic groups. 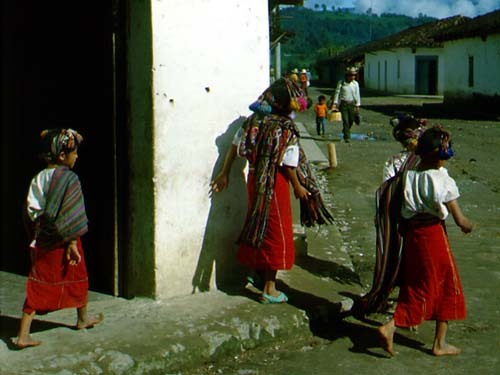 The three towns define the "Ixil Triangle", an area very hard hit by army and guerrilla activity in the early 1980s. Four young girls at a Nebaj street corner (8/77). 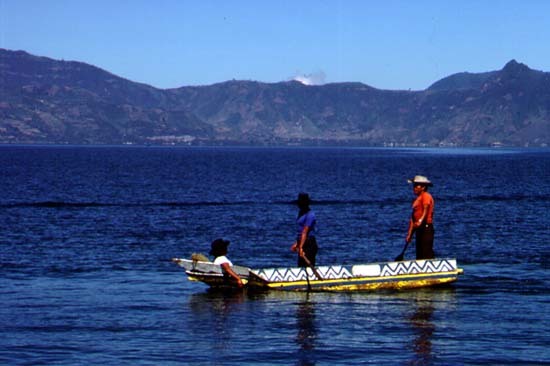 Santa Catarina is another of the villages perched on the shores of Lago Atitlán. Legend has it there are 12 Atitlán villages, one for each of Christ's disciples, but of course many of the villages pre-date the conquest and introduction of Christianity. 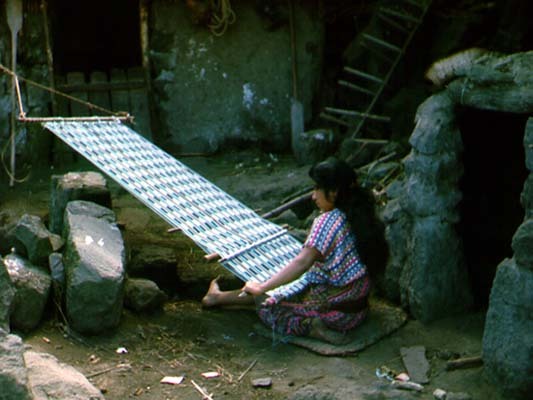 Here a young girl of Santa Catarina demonstrates her weaving skills on the backstrap loom, while a second, probably her sister, watches the photographer. 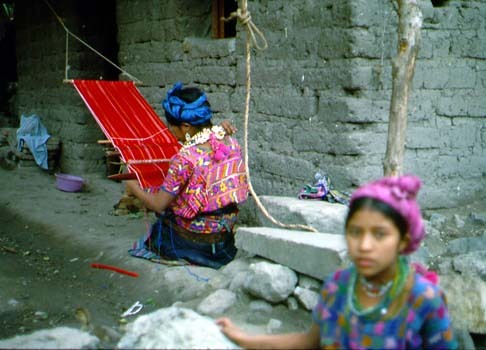 Note that the weaver is working with red cloth, but that her huipil is almost completely covered with embroidery in pink and other colors. The huipil of the second girl is mainly blue. Both huipiles are covered with small embroidered geometric figures. Since this photo was taken in 8/77, red Santa Catarina huipiles have been largely replaced by huipiles completely dominated by deep blue, enlivened by geometric spots of other colors, including hot pink, a distinctly modern touch. Snuggled in a valley high in the Altos Cuchumatanes, well off the usual tourist routes, lies the Mam town of Todos Santos. 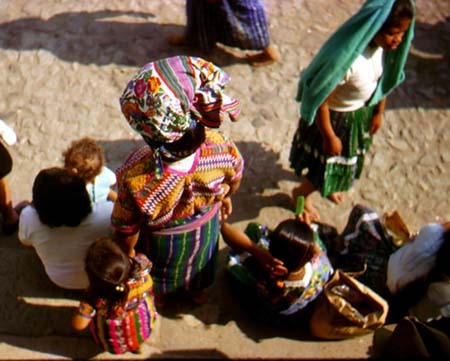 This town was the site of a famous anthropological/ethnological study by Maude Oakes, described in her book The Two Crosses of Todos Santos (1951). 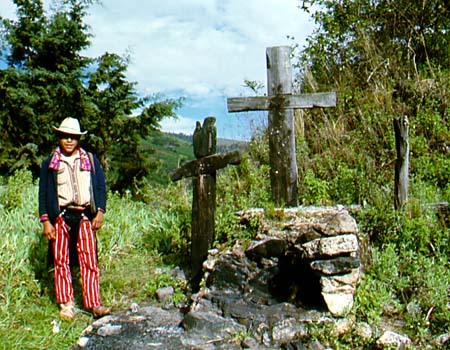 Here we see a young Mam man standing by the two crosses, located in an archeological site on a knob above the town. (Photo 8/77.) He wears the bold red and white-striped calzoncillo worn by all the Todos Santos men, complete with a dark blue-black wool sobrepantelón (literally "overpant") split up the front so that it hangs loosely and serves little actual body-covering function. 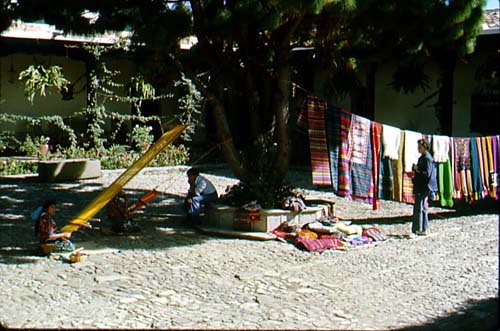 Todos Santos is the only village in Guatemala where the sobrepantelón is still commonly in daily use; in 1977 its use was near-universal among Todos Santos men, but today it is in decline. In other villages it is used only for ceremony, if at all. A camisa (shirt) with narrow vertical stripes and a wide, heavily embroidered collar, topped off by a western-style straw hat, and a wool jacket completes his outfit. A few decades back the men's pants tended to be more white with red stripes, and some white pants with a red plaid striping were worn. But in recent years the white has become reduced and the pants are more red with white stripes today. 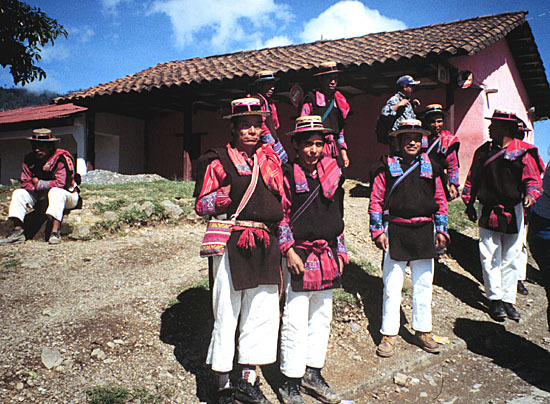 In contrast to some Indian men from other towns (who may wear their traditional costume in their home town, but switch to western-style clothing for travel outside) the men from Todos Santos travel to Huehuetenango and further, to Guatemala City upon occasion, still decked out in full traje, proudly proclaiming their origins. 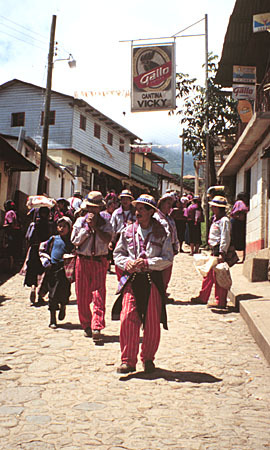 Another mountain village where both men and women dress in traje is San Juan Atitán. 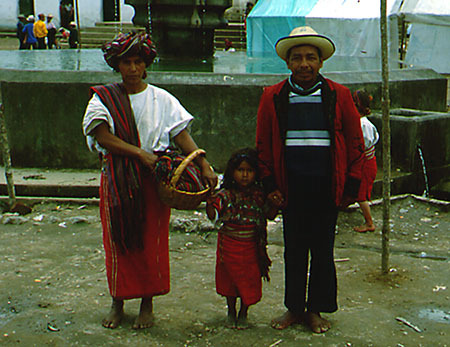 The red camisa and flat straw hats show that this man and his son, photographed 5/93 in the departmental capital, Huehuetenango, are from San Juan. 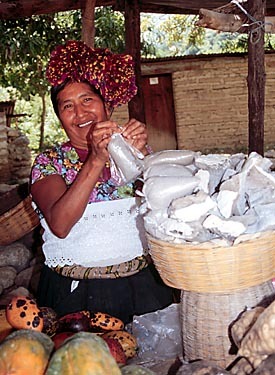 Huipiles from San Mateo are often sold in well known markets such as Chichicastenango, but the buyer should be on the lookout for low quality huipiles made expressly for sale to tourists. These characteristically are relatively small, made of a single layer of cloth, and embroidered with large stitches on one side only. 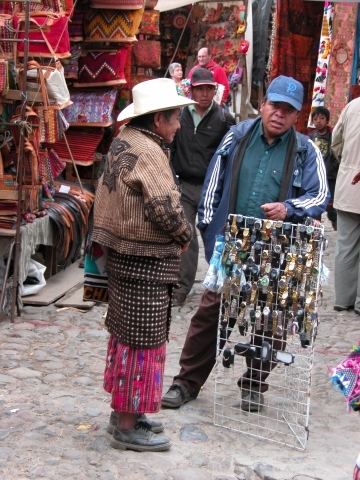 Tourists wishing to purchase higher quality goods might do well to consider buying used huipiles. 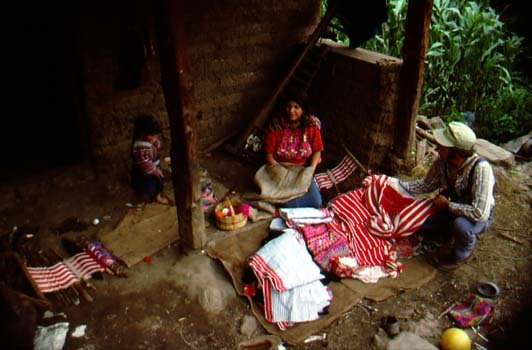 In general, clothing that the indigenas have made for their personal use will be of better quality than work made for the tourist trade. 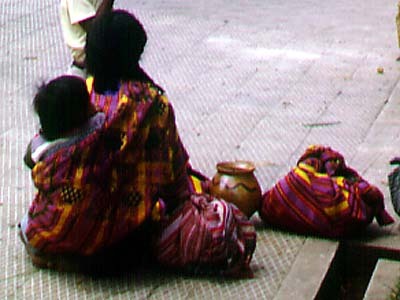 Sololá, the capital of the department of that name, is an important Kaqchikel town in which much colorful traditional dress can be seen. 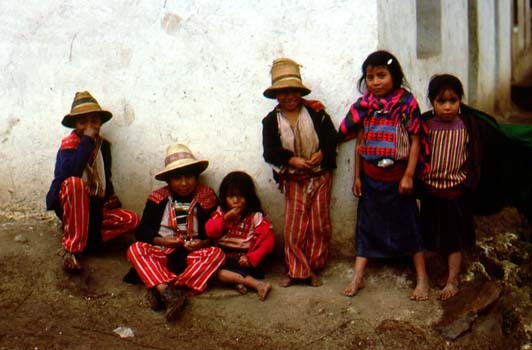 Solotecos wear a striped camisa and differently striped pantalón, and Solotecas wear a striped huipil; red is the dominant color in these garments, with many other colors skillfully blended in. The jaspe or ikat technique is used in weaving the striped cloth. In ikat, some thread is tie-dyed prior to the weaving of the cloth, and then woven in to produce a distinctive "blurry" pattern. The finished clothing may be further embellished with embroidered geometric designs. 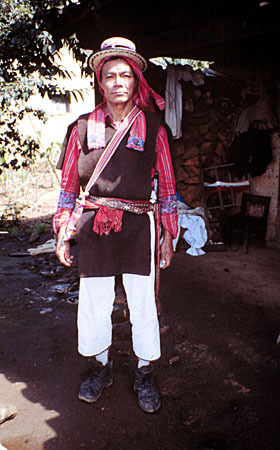 In this family group the man can be seen wearing a rodillera or wool kilt-like wraparound worn over the pantalón. (Photo 8/69.) 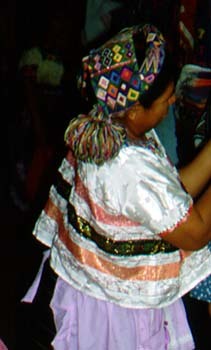 The man's outfit is commonly completed with a short white or brown wool chaqueta decorated with braid, as this man is wearing. 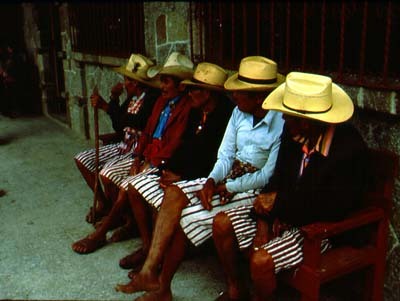 (Photo 10/08) Today, most of the Solotecos wear factory made straw cowboy hats. 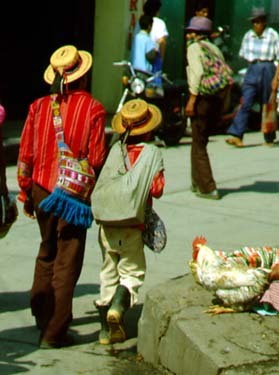 A couple from Sololá selling vegetables in the produce market at Chichicastenango. 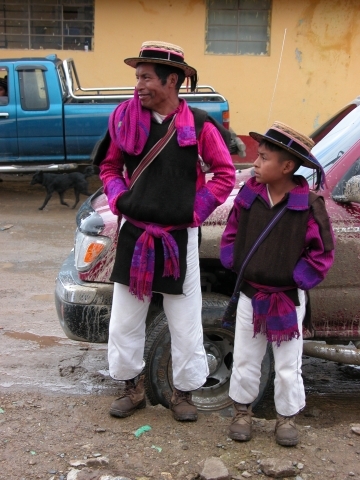 Although their town is right on the Pan American highway, the people of Nahualá, both men and women, have largely maintained the custom of wearing traje. 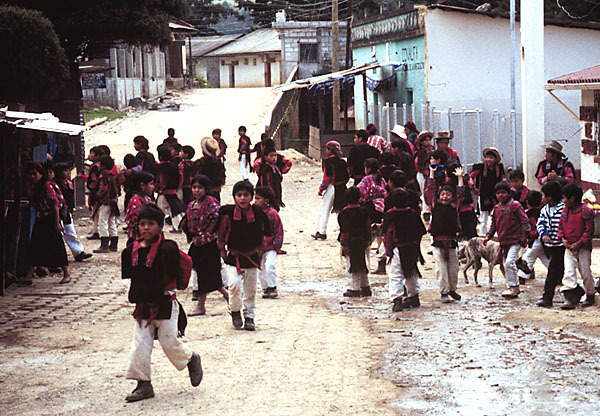 The men of Nahualá and Nahualá's sister town Santa Catarina Ixtahuacán, wear a wool kilt instead of pantalones. 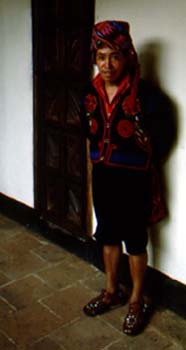 The Nahualá man's camisa is typically dyed dark blackish purple or bright red, and finished with broad golden cuffs and collar of European origin. In recent times camisas of other colors, including bright orange and lime green, have gained favor. Western cowboy style straw hats have also become popular here. 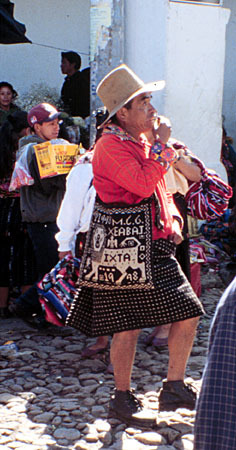 This Nahualense was photographed 6/01 in the market at Chichicastenango; perhaps his large wool morral is filled with purchases. 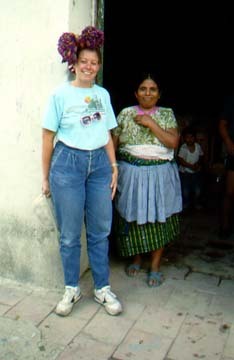 Manuela is an affable but shrewd Nahualá woman who very willingly poses for photos, all the while encouraging the visitor to come to her house to see what she has for sale. (Photo 8/96.) In addition to her native K'iche' idiom, she is fluent in Spanish, as are most of the better educated and economically successful indigenas. However, in backwoods parts of Guatemala, many of the Maya speak only their native tongue, whichever of 21 different Maya-derived languages this may happen to be. 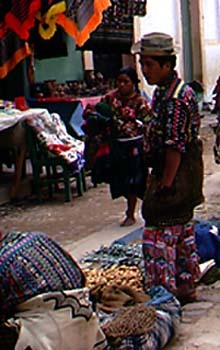 Chichicastenango, a K'iche' Maya town, is an important regional market, and a good place to see a wide variety of traditional costume. 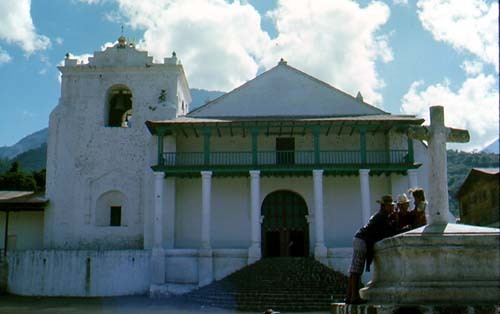 However, "Chichi" has become so popular with tourists, that, much like Santiago Atitlán, it has lost some of the picturesque charm it had in the less hectic 1960s. Market days are Sundays and Thursdays, and the steps to the 400-year-old church of Santo Tomás are always crowded with vendors and worshippers. 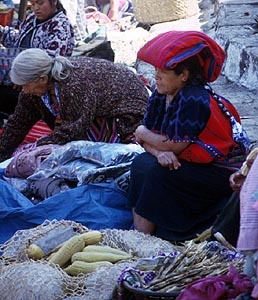 The market stalls crowd practically up to the foot of the steps, where these fruit vendors were photographed in 8/69. 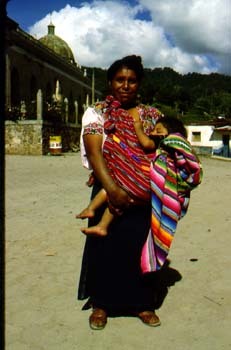 The huipil of Chichicastenango can always be recognized by a distinctive symbolic sunburst design around the neckhole. Men of Chichi are known as Maxeños, and the Maxeño traje, which is not worn on a daily basis by the majority, is one of the most elegant in all Guatemala. 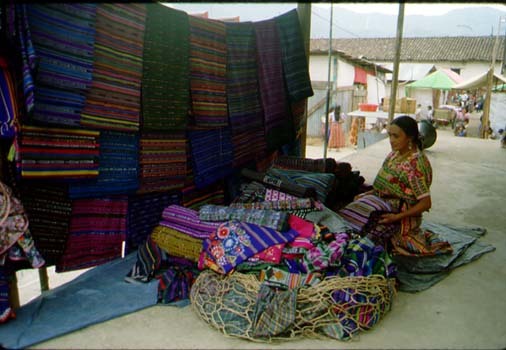 The traditional Zacualpa huipil pattern has been adapted for the production of purple and red bedspreads, and further modified to other color combinations such as green and gold. The bedspreads are attractive, but wholly a modern product for tourism. 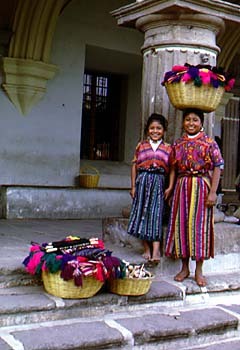 The collection of photos on this website merely hints at the great variety of beautiful traje to be seen in Guatemala. If colorful costume, exquisite weaving skills and traditions, and fascinating people interest you, you should plan a visit to Guatemala. Fowler Museum of Cultural History, UCLA, 191 p.
in the U.K., 72 p.
El Salvador:  Norman, OK, Univ. of Oklahoma Press, 385 p.
Schevill, Margo Blum, ed., 1997, The Maya Textile Tradition:  Harry N.
Abrams, Inc., Pubs., 232 p.